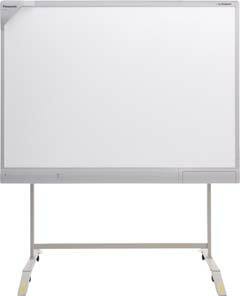 Panasonic has released three new models in its Panaboard line of interactive audio and video whiteboards. The three new models--the Elite Panaboard UB-T81W, UB-T81, and UB-T761--are electronic whiteboards that include an integrated stereo sound system, enhanced text and graphics, and onboard streaming media playback compatibility, including SWF, AVI, WMV, MPEG-2, and other formats. Spotlight mode for highlighting a specific portion of the screen. The UB-T761 offers a 64-inch (diagonal) screen size, the UB-T81 a 77-inch screen size, and the UB-T81W an 83-inch screen size. The new Panaboards are available now. Pricing information was not available at press time. Further details can be found here.